Joe Shlichta’s “Tools of the Trade” and Linda Jo Nazarenus’ “Passing Through” are showing through June. There’s landscape painting that’s just landscape painting — and then there’s landscape painting that veers toward parable. Two new gallery shows by Seattle artists take the latter approach, with Joe Shlichta’s “Tools of the Trade” at Artifact Gallery and Linda Jo Nazarenus’ “Passing Through” at Lisa Harris Gallery both bringing idiosyncratic twists to the genre. Shlichta’s show is unexpected because it’s such a departure from his previous work. On www.joeshlichta.com, you can dive into his heady takes on estuaries, fast-flowing rivers, brambles, blossoms and foliage of every variety. But in “Tools of the Trade,” his eye is on urban settings. 10:30 a.m.-5:30 p.m. Mondays-Saturdays, 11 a.m.-4 p.m. Sundays, through July 2, Lisa Harris Gallery, 1922 Pike Place, Seattle (206-443-3315 or www.lisaharrisgallery.com). The fast-changing Seattle neighborhood of Capitol Hill, where old real estate is being razed to make way for new retail centers and apartments, inspired these oils on linen and oils on panel. Demolition and wreckage, in Shlichta’s hands, take on a wild entropic-organic character. A painting called “Obsolete” is the grandest in scope. It shows tattered rafters looming over twisted heaps of debris, with a hint of smoke rising from the ruins. Fallen lumber and piles of steel ribbon serve as a foreground to buildings that haven’t met the wrecking ball yet. The line between figurative and abstract is often difficult to decipher. Along with being depictions of specific scenes, his pieces are color explorations, as the title of one painting, “Van Dyke Brown,” indicates. 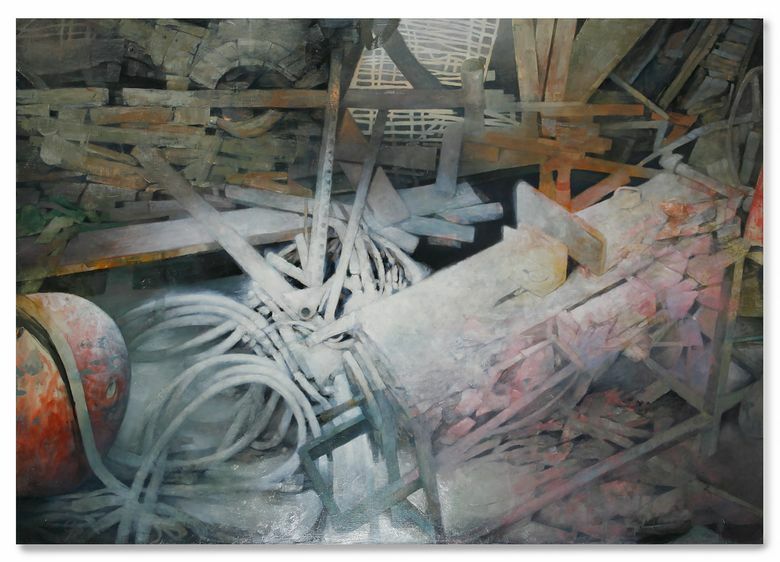 “Van Dyke Brown” is a loving rendering of complete collapse, with industrial piping and girders as entangled as worn-out lovers. A lath-work structure in the backdrop is barely standing. Through a haze of soft pink, blue, gray, orange and tan, you can all but smell the plaster dust. 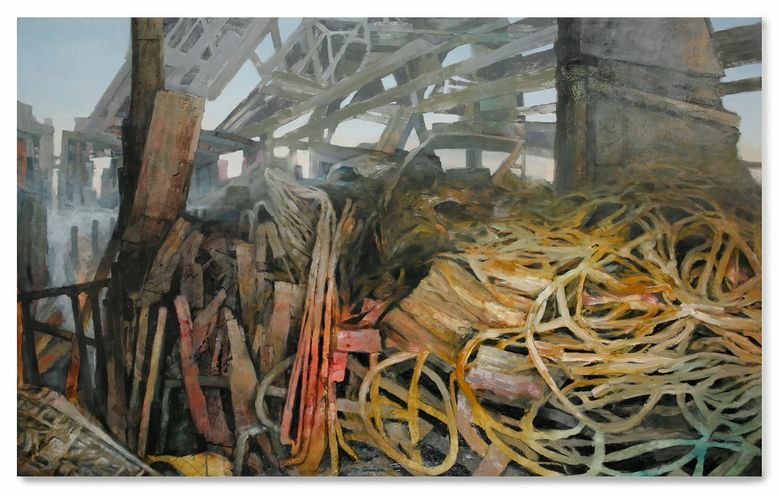 In other paintings, certain objects — plastic chairs, hoses — glare under garish fluorescence. There’s something sickly about them that might prove hazardous to your health. All Nazarenus’ paintings are oil and/or acrylic on canvas or panel, and her reverence for Northern European Renaissance tradition — where layered glazes make the details glossy and sharp — is evident throughout. She’s clearly a painter who can do anything she sets out to do. The show’s title painting, oddly, verges on the cloying with its prairie dogs popping up in a moonlit nightscape. 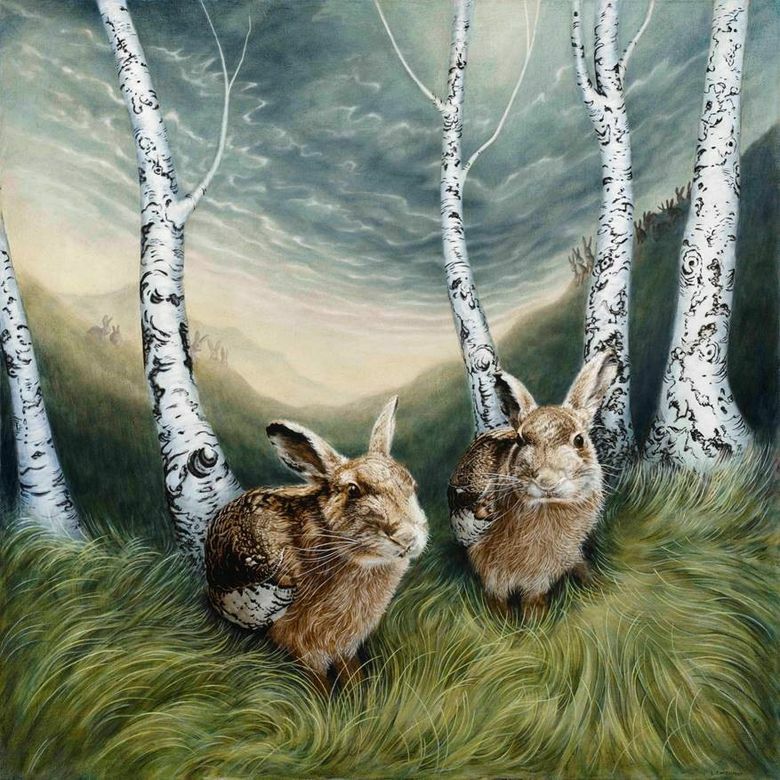 But the roiling, cyclonic energy Nazarenus brings to her skies and landscapes in most of these paintings takes you somewhere deep, elemental and mysterious.